There’s a certain number of people out there that have thought, “I wish Melt-Banana would just be more intense!” That number hovers around zero. But they’ve gotten more intense. The Japanese noise-punk group has been established, since the mid-90’s, as one of the leaders in the world of total aural assault. Their earlier albums were nonsensical blasts of noise, each track often lasting less than a minute. In the 2000’s, they gravitated towards more conventional song structures while still maintaining that furious intensity. 2003’s “Cell-Scape” was a goldmine of pop-brutality. After six years of inactivity, they’re back, and “fetch” makes those six years excusable. It should be mentioned that they took time off because of problems faced in their native Japan – an earthquake in Tohoku and the nuclear meltdown at Fukushima left the band putting their careers to the side to help their country. But the return is still welcomed – because they’re back to their experimenting. Sometimes the band experiments, other times they just put out noise albums. But “fetch” sounds like the album that should’ve come out before “Cell-Scape.” To put it simply, this is the Melt-Banana album I’ve been craving since I got into them roughly six years ago. “fetch” starts off with ocean waves and a synth rhythm, a bit of a red herring intro that also acts as a metaphorical apology for the band’s unintended hiatus. The song builds up, finally ending in intense Melt-Banana form. For those unfamiliar with the band, that involves guitar and drum paired with squeaky high vocals and drums that sound like they’re being murdered. Follow up “The Hive” is more of a traditional track, at slightly over two minutes. A slight majority of the songs on the album are under the 2:30 mark, and all except an interlude are expectedly intense. But what makes this album great – maybe even their best – is the way it uses typical song structures to sound even more brutal. “Cell-Scape” loosely framed its songs around rock structures, but didn’t advance much beyond them. “fetch” takes a typical structure, allows the band to slow down just a little to add a noticeable energy, and intersperse typical songs against blasts of noise. The final track, “Zero,” almost comes close to resembling the Yeah Yeah Yeahs song of the same name, as a synth-based dance-number. But yet, the tracks before them are still brutally fast. 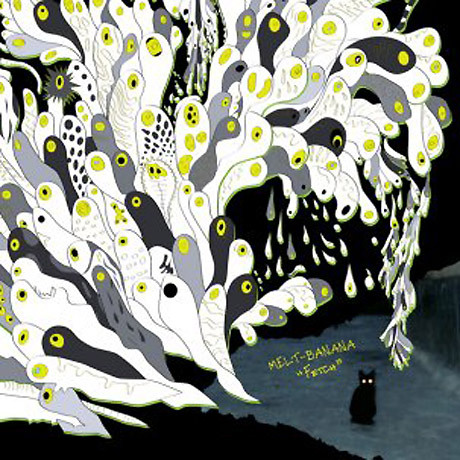 Melt-Banana stretches their own boundaries on this album. The vocals aren’t as high-pitched, and the drums are on a less consistently melodic, Zach Hill type of brutality, which automatically sounds different. “fetch” honestly would’ve been a wonderful intro to “Cell-Scape,” now 10+ years removed. But with the mediocre “Bambi’s Dilemma” standing as their most recent release, “fetch” is more than a welcome return – it’s a noisy, assaulting and relentless piece of noise-punk that recognizes its boundaries, always going to them but never going over. Melt-Banana is not a band that has a wide audience in America, but for those that do enjoy, they’ll hopefully accept “fetch” as an apology for a long absence. If you like this, try: Lightning Bolt’s 2005 album “Hypermagic Mountain.” Two guys from Connecticut created one of the most feedback-laden, noisy masterpieces of the ’00s.